Appleby Library is part of the Summerville Historic District. The City of Augusta owns the building and uses it as a branch library of the East Central Georgia Regional Library System. The house is significant as an example of the Greek Revival style of architecture and for its long life as a permanent edifice in the Summerville Historic District. 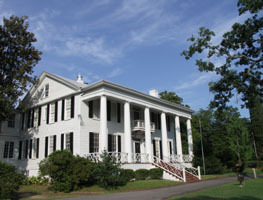 Constructed c. 1830 as a summer residence for Judge Benjamin Holmes Warren (1797-1870), the home displays attributes of the popular Greek Revival style. Painted white, the 2-story wood-frame building has six over six double-hung sash windows and 2-story porticoes. Its north and south facades each boast six 2-story fluted Doric columns to support the heavy architrave. A narrow line of transom and sidelights surrounds the door. After the death of Judge Warren, his wife sold the house to Janet Montgomery in 1871. Although it changed hands several times among her heirs, the house remained in the Montgomery family for several decades. Percy May, a noted banker and former mayor of Augusta, rented it in the early twentieth century. In 1919, William P. White, another former mayor of Augusta, purchased the house. Scott B. Appleby bought it in 1928 from May White, the widow of William P. White. Appleby bequeathed the home to his wife, Annie De Prairie. After she died, her son, James Scott Appleby donated the house in 1954 to the Augusta City Council for use as a library. Dedication ceremonies took place in the gardens on May 30, 1955. Fortunately, throughout its life the home has witnessed only small changes in its exterior appearance. In the early 20th century, noted Augusta architect Henry T. E. Wendell designed the current rear façade. Scott B. Appleby updated the interior. He installed bathrooms by cutting out space from chimneys in the upper bedrooms, added a large bedroom at the rear of the house, a kitchen, and service quarters. He also removed a partition between the front and back parlors to create a large drawing room. Paneling on the ceiling makes the two rooms seem as one. Appleby Library, also known as the Montgomery Place, is an integral contributing component to the composition of the Summerville Historic District. Home to important Augustans throughout its existence, the building is almost a textbook example of the Greek Revival. The property continues to be important to the community in its role as a neighborhood library offering many outreach services such as a summer outdoor concert series, “Evenings at the Appleby,” and a children's reading hour. Appleby Library is located at 2260 Walton Way, within the boundaries of the Summerville Historic District. The building is open to the public. Call 706-736-6244 for information.